Getting background tasks right is important. We want our UIs to remain responsive while the background task does its thing. Here I'm going to focus on Android's 'bound services' and a neat pattern for getting background work done on some shared resource, such as an internet connection and updating UI and/or model components. Let's suppose we want our app to have an activity that can fetch some data from the internet when the user clicks a button. The internet request will likely take some time so we have some background task to perform. First problem! What about config changes? If you want to read more about this problem, here's another blog post. Now, let's say we also have another background task that is currently syncing the users data at the same time as we want to make our quick network fetch for the user. This may be ongoing for some time and hog the network connection and so seriously slow down the experience for the user. If your interaction is more timing-critical this becomes a real problem. There is no way to prioritise the button push over the ongoing sync. So what we really need is for some way to do background work on a shared resource (the internet connection) and have the results delivered to the UI reliably. Using singletons to hold the asynctask. A singleton is probably overkill for this problem. You would also difficulty to tracking what currently needs to use the network in order to resolve conflicts. Making a new AsyncTask after each rotation. This solution can actually be preferable. See Romain's actual answer to the question linked above. Permanent service. We could use a regular service and leave it running whilever our app is active (or longer?). But this is a very poor memory management - we should use services sparingly - and trying to improve this by managing the service lifecycle ourself seems painful. Allow multiple application components to access the resource at once. Possibly adding priorities to this to favour some operations over others. Be a good citizen. Don't just use a permanent service to host background work. We probably need some kind of service to allow different application components to access the same resource but we shouldn't leave that running forever more. So, by storing objects related to ongoing work in the fragment we can keep stuff connected to the Activity across config changes and deliver our results to the UI, but we are still no closer to being able to prioritise internet connections in a central place without using a singleton or firing up a permanent service. A bound service allows components (such as activities) to bind to the service, send requests, receive responses, and even perform interprocess communication (IPC). A bound service typically lives only while it serves another application component and does not run in the background indefinitely. A client can bind to the service by calling bindService(). When it does, it must provide an implementation of ServiceConnection, which monitors the connection with the service. //Our request is finished and we don't need the service any more. This is the key to ensuring we keep a service alive only exactly as long as required. 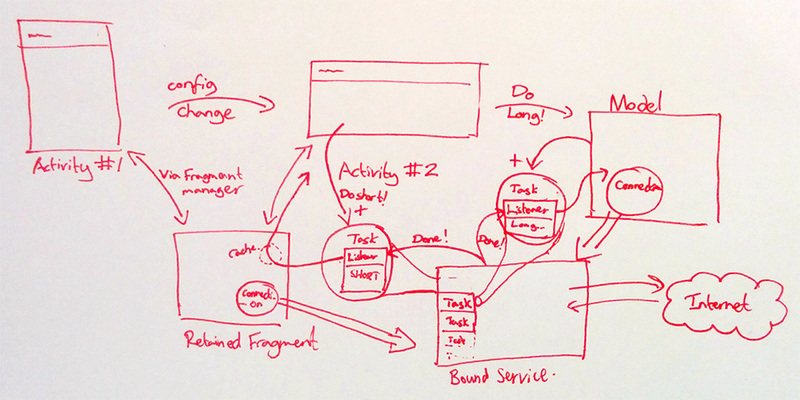 "Should I bind from the app context or the activity context?" "But if I bind from the application context, can I bind from it multiple times in different places or do I need to reference count and work out when to unbind myself?" This is actually poorly documented and inspection of the Android source reveals that this it is safe (again, see my StackOverflow answer here) to bind several times from the application context without worrying who else may have bound. It's key to keeping bound services easy to use. Bringing this all together, I have created a test application for using bound services. This uses two methods of making requests on our bound service. - one short, high priority request that updates the UI, "Quick Operation", and one long running background task that the model performs, "Slow Operation". If the activity is currently not attached to fragment (as could happen during a rotation), we cache the result in the fragment until it reattaches. When you are working with a shared, scarce resource (internet, bluetooth connection, lengthy processing pipelines) and want to make sure your requests are guaranteed to make it to the UI. Even if you aren't using a shared resource and don't require a bound service, you can still revert to using an AsyncTask with a retained fragment. Ultimately, there are a couple of tools here you can put to good use in the right circumstances. 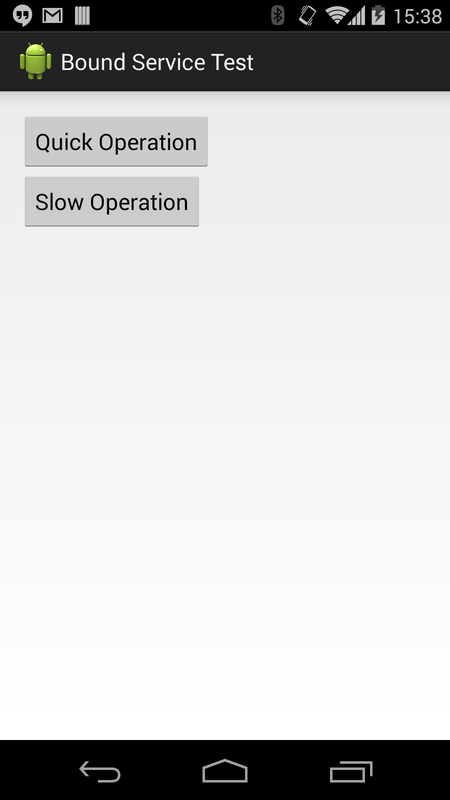 Loaders and loader manager. These function similarly to a retained fragment. They can be created and reconnected to across activity config changes. These are more appropriate for lists with cursors. Specifically, a Loader should 'monitor the source of their data and deliver new results when the contents change'. For more information, check out the Loaders dev docs.